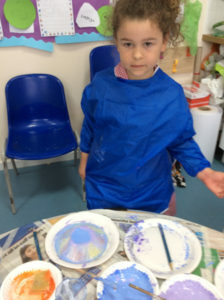 This week the children immersed themselves into their under the sea adventure. 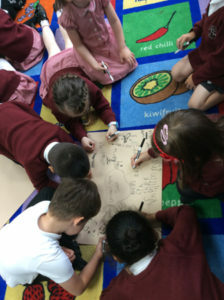 To start the new topic the children shared what they knew about under the sea and what they wanted to find out. 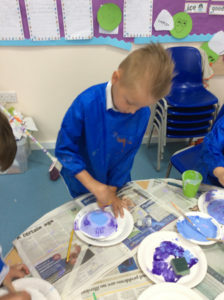 Following this the children engaged in a variety of craft activities to make crabs, starfish, jellyfish and fishes. The children watched a video about scuba diving and thought about what they would do if they were a scuba diver. After lunch the children listened to the story Commotion in the Ocean and developed their knowledge of some animals which live under the sea and their characteristics. On Tuesday the children thought of words to describe some of the animals in the Commotion in the Ocean story. Following this the children were shown how to put their descriptive words into a sentence. The children were challenged to write their own descriptive sentences during their learning time and they also labelled pictures of a turtle and a fish. After lunch the children practised their letter formation for the sounds a, b, c, d, e and practised writing the tricky words ‘be’ ‘to’ ‘my’. 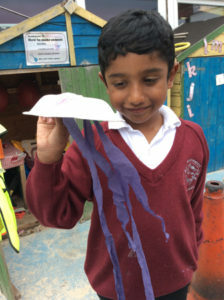 On Wednesday the children were given clues and they had to guess which sea animal they thought it was. Following this the children created their own ‘what am I?’ lift the flap card, where they wrote clues and then drew their animal inside. It was great to see the children’s confidence to write independently developing. 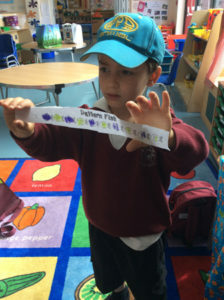 On Thursday the children developed their understanding of addition as counting on using sea creatures and number lines. The children saw an amount of animals, circled the number on their number line, counted some more animals and jumped on along their number line to find the answer. During their independent learning the children explored some addition activities: Activity 1 -roll 2 dice and add the dots, then record the corresponding addition; Activity 2 – put some counting objects on either side of a strip of paper and then remove the strip of paper and count how many altogether, finally the children recorded their addition on a whiteboard; Activity 3 – cut and stick 1-20 ordering activity. Before lunch the children looked at the Commotion in the Ocean story and identified the rhyming words for each animal and then the children were asked to think of additional words that rhyme with words from the story. After lunch the children practised their handwriting and tricky words. On Friday the children used playing cards 1-10 to create additions. 2 children were chosen to come a choose a card and then the children used their number lines to find the answer (circling the 1st number, jumping on a given amount and then circling the answer). 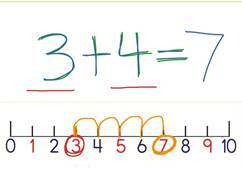 It would be fantastic to see the children using a number line to complete an addition at home. Before lunch the children adapted the rhyme Little Miss Muffet to create their own rhyme about a little orange fish and a big grey shark. It was lovely to see the children’s rhyming developing throughout the week. During ICT this week the children continued to develop their addition by playing the game ‘Save the whale’ on www.ictgames.com The children dragged up the pipe to show how many more they needed to make a given number and then they had to click on the wheel to see if they have saved him. This image shows how to use a numberline to count on.